Health conscious Barrie dwellers who like to visit Ontario farmers’ markets in summer tend to lose enthusiasm for buying local foods once temperatures drop. It’s as though the first snow blanket over those pick-your-own strawberry fields tries to cover up all our good intentions for making eating local Ontario produce a priority. But eating local is easier than you think…even in winter months. In fact, eating farm fresh foods after the growing season is not only possible—it can be economical and enjoyable, too. 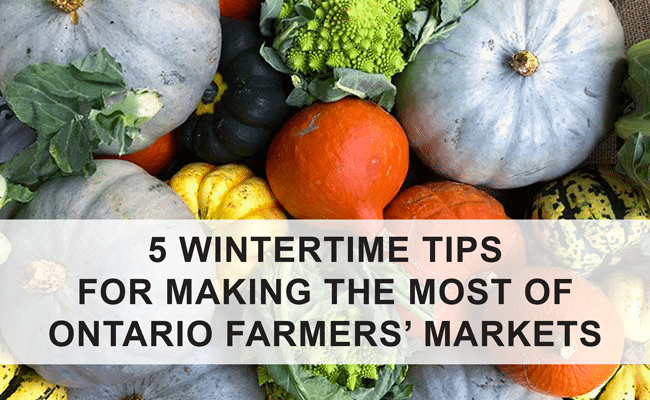 By planning and preparing during summer months and applying these tips in winter, you can make the most of the many farmers’ markets Ontario has to offer and strengthen your community in the process. If you’re wondering where to buy Ontario produce in winter, visiting a farmers’ market where local farmers bring their choice produce is a great place to start. You may be surprised to learn that Ontario has many year-round farmers’ markets taking place on Saturday mornings as well as other days of the week. Here local farmers continue to offer healthy and tasty farm fresh produce and greenhouse goods at prices on par with big grocery store chains. If you’ve never visited one in winter you will likely find it to be a different experience from the hustling hub you visited in summer. Come November, farmers markets typically move indoors and take on a whole new vibe. New smells of fill the air—sometimes wood smoke, simmering soup, or fresh breads. The pace slows and people seem to linger longer and chat more. Local artisans share their woolly and winter wares. Comfort foods in the form of local meats, cheeses, honey, breads, jams and other prepared foods take centre stage. And the cozy and pleasant atmosphere creates an experience that is so much more than a trip to the grocery store could ever give. Barrie has a year-round farmers market that takes place inside city hall on Saturday mornings. Orillia, Innisfil, and Elmvale-Springwater have winter markets as well. Although it may be a little out of the way, taking time on Saturday morning to visit a farmers market near you can offer you local seasonal produce while offering a very enjoyable shopping experience. There are bargains to be had when purchasing fresh produce at farmers markets, even in winter. Barrels of potatoes. Bags of winter greens. Bins of squash. Vendors will often discount produce when selling in greater quantities and sometimes at the end of the market day. Knowing when to buy and what types of foods to look for can provide real savings. However, if you don’t like the smell of rotting potatoes or finding half composted salads at the bottom of the fridge drawer you’ll want to be sure you are likely to use the food you purchase. Knowing how long various types of produce stay fresh can provide some sense of certainty. Here is a list of common foods and the typical shelf life for each whether refrigerated, frozen, or stored at room temperature. If you’re looking for something that’s not on this list do a little homework before you head out. Buying but not using produce is a waste and an inconvenience. Arming yourself with shelf-life knowledge will help you choose those foods you’re most likely to consume and save you money in the long run. Some say you should make a list and buy only what’s on that list when you shop for groceries. But when it comes to sourcing foods locally, it’s good to go to market with an open mind, too. Seeing, smelling, and touching the local produce in person is often the best determinant for what your body needs. Sometimes it’s not until you see that vibrant veggie that you realize what you and your family are craving. And since winter produce such as squash, apples, potatoes, cabbage, onions, turnips, beets, and collard greens are incredibly versatile, it makes sense to wait and make those final choices in person. You can also receive inspiration for delicious winter menus from those who grow the food you’re buying. Often, farmers will provide unique recipes for the ingredients they’re offering or provide special preparation tips for the produce on hand that week. Slower-paced winter markets offer great opportunities to collect ideas from growers, vendors and information booths. Visiting them with an open mind for trying new or different things can help you enjoy local foods in a whole new way. Although the above tips target the colder months, produce is obviously tastiest and least expensive at season’s peak. What foods do you miss most come winter? With a little forethought you can enjoy those and other locally grown food year round, too. If you don’t know much about how to freeze produce or prepare preserves, winter may be just the time get started in your reading and gather your supplies. You can also take this time to research and note when that produce in your area becomes available so you can buy in bulk at the most opportune times for flavors and savings. This harvest schedule shows when the crops of Barrie Hill Farms are most likely to be in season. Making the extra effort to visit a local farmer’s market and buy local Ontario produce can be financially beneficial and personally satisfying. It can also help build community, protect our environment, and strengthen our local economy. We hope you will come see us at Barrie Hill Farms in the spring, summer and fall when our own farm market is open!